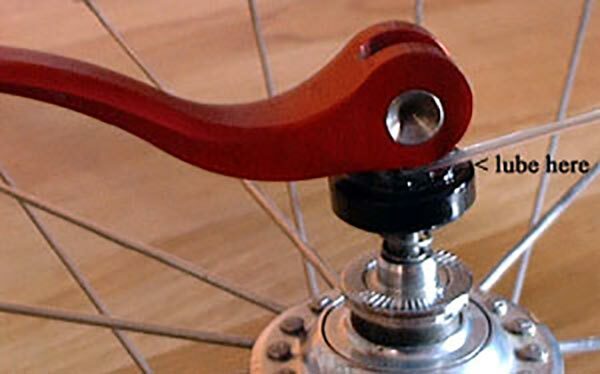 Bicycle wheel quick releases make it easy to remove wheels without tools. They’re a great bike feature when you’re removing wheels to put a bicycle in a vehicle and if you need to repair a flat tire. 1) Most levers have the words “Open” and “Closed” stamped right on them, so look for that. 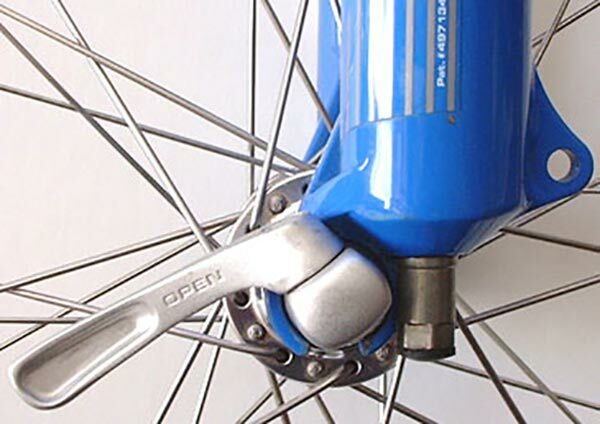 The quick release in the photo reads “Open,” meaning that the wheel is not properly fastened and it may come off–even if the wheel and lever feel tight! 2) Levers are usually curved. When the bend of the lever’s curve protrudes outward like a bump, the lever is closed. When the bend is cupped (photo), the lever is open. Closing and opening the lever requires flipping it 180 degrees, not spinning it. 3) If a quick-release lever sticks out from the frame (isn’t flush with it), that also means it is not fully closed. It may seem to be holding the wheel(s), however, a protruding lever is not locked shut and it’s possible for it to come loose or get knocked loose if you bump it into something. Be sure to close the quick release fully if you see this to ensure your safety. Please note, that even if the lever reads “Closed” and looks right, it’s a good idea to test how tight it is by trying to open it by pulling on it with a little effort. If it resists, it’s tight and safe. If it opens with only a little effort like this, it’s not tight enough. Follow our directions to tighten it. The repeating animation to the right shows how the quick release is closed to tighten the wheel in the fork/frame. Notice that it is flipped over on itself 180 degrees. If you do this and the quick release doesn’t feel tight, or if the wheel is still loose, you need to adjust the quick release’s tension. Once you have the quick-release tensioning adjustment right, make sure the wheel is fully inserted and centered in the fork (or frame) and fully close the quick release and you’re ready to ride. The quick release tension adjustment won’t change on its own. To do this, hold both ends of the quick release and turn one counterclockwise to unscrew it until there’s enough clearance for the wheel to drop out of or fit into the fork (note that this adjustment is unnecessary on most rear wheels because rear retention tabs aren’t used). If you close the lever in such a way that it aligns with the fork and stays, you’ll have something to grip with your fingers while squeezing the lever with your palm. It’ll also keep the lever tucked away where it can’t snag anything, which might happen leaning your bike next to another in a bike rack, for example. If you ever unscrew the quick release until it comes apart fully, don’t panic! Just try not to lose the little springs. They’re not crucial and the quick release will work without them. They’re only there to provide spring pressure to maintain some clearance between the ends of the quick release and the axle locknuts to make it easier to slide the wheel into the frame. To reinstall the springs, make sure that the narrow ends point in. About once a month, lube your quick-release levers because dry levers won’t work well and can feel like they’re closed and holding the wheel tight when they’re not. Steel levers usually pivot inside the cap. Apply lube to trickle it inside the lever’s pivot point. If there’s a nut or screw holding the lever (look at the bottom of the cap), snug it with a wrench or screwdriver to make sure it’s tight. If you have any questions about quick release use, just let us know and we’ll be happy to explain more in person.